Find out what really happened by adding this slice of history to your own library today! Like thousands of people the world over I read Anya Seton’s wonderful book “Katherine” about Katherine Swynford when I was a teenager. I remember staying up all night I was so engrossed, and when the time came for me to go to school the next day, taking the book with me and reading it in class. My grade 12 English teacher obviously knew what I was doing, but turned a benevolent blind eye, with a conspiritorial wink. You can contact your local bookstore and ask them to order the book in for you. Clicking on the buttons above will redirect you to our publisher, Dog Ear Publishing, based in Indianapolis, Indiana, USA. On the Dog Ear website your order will be processed and shipped within 24 hours. Your invoice (priced in US dollars) will clearly indicate the shipping costs, and give you a choice of shipping methods from which to choose. If you ever read ‘Katherine’ by Anya Seton and wondered what happened, now is your chance to find out! This well researched trilogy draws you into the life of John of Gaunt, Katharine de Roet, her brother in-law Geoffrey Chaucer and their friend John Wycliffe WARNING: Once you start to read Book One, you will not want to stop until you reach the end of Book Three; and then you will wish there were more. Carol Sargeant, a new author who has appeared on the scene, is poised to do well with the first book in her Love, Honour and Royal Blood series that should appeal to a wide and diverse range of readers. First and foremost it will appeal to those who enjoy a classic romance; more inline with something by Jane Austin than the current crop of romance writers. Readers will be pleased to put ‘Katharine Swynford’ (the first book in the Love, Honour and Royal Blood trilogy) on their bookshelf of most cherished treasures. This is a book readers will want to read more than once. Furthermore, those readers who are interested in serious history should be put off by the fact that romance is involved. You will not need to read very far to find out that this is the story of real people who not only lived, loved, warred and intrigued; but who also made their mark on history. And what a history they wrote, and what a world they lived in! This time period covered such dramatic events as the advent of the Black Plague, the Hundred Years War, and the start of the Reformation. 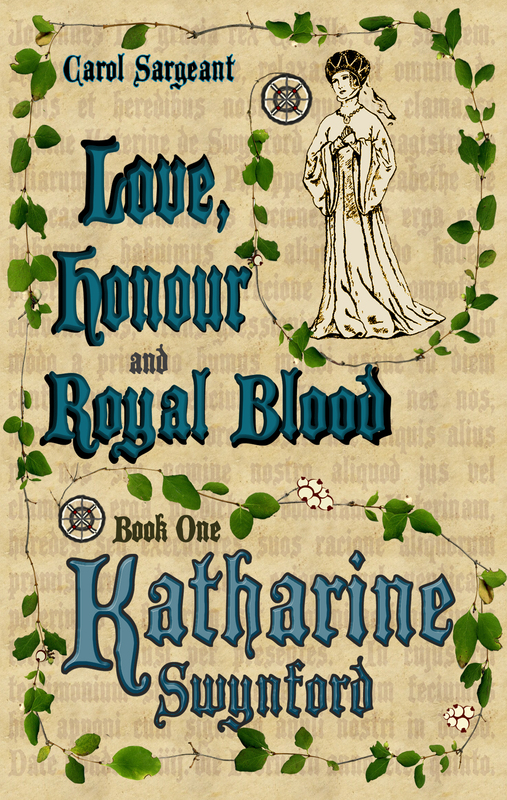 Love, Honour and Royal Blood is a very readable book – a true page turner – where people like Geoffrey Chaucer, William Wycliffe, Richard II and Henry IV come alive. The people in ‘Katharine’ (book one in this series) are not mere characters created out thin air. These famous people were the friends and family of John of Gaunt (Duke of Lancaster), and Katharine Swynford (ancestress of Royal families). All of their lives were intertwined. Love, Honour and Royal Blood is well worth reading. To see what others have thought about the book, you can read reviews and media coverage here. If you’d like to know more about the author and what motivated her to write this series, you can read about Carol Sargeant here.